Met Éireann has issued a status Orange warning for Clare and 12 other counties, with gusts of up to 130 kilometres an hour expected overnight tonight. Here, Clare County Council has held meetings involving various responders as they monitor the expected situation locally. Storm Callum is expected to make landfall in Cork and Kerry at around 10pm, moving towards Clare by around midnight. But all coastal counties have been put on alert as Gusts of up to 130 kilometres per hour are forecast in exposed locations. Winds will continue into tomorrow morning. Met Éireann forecaster Deirdre Lowe has been outlining what’s expected here. 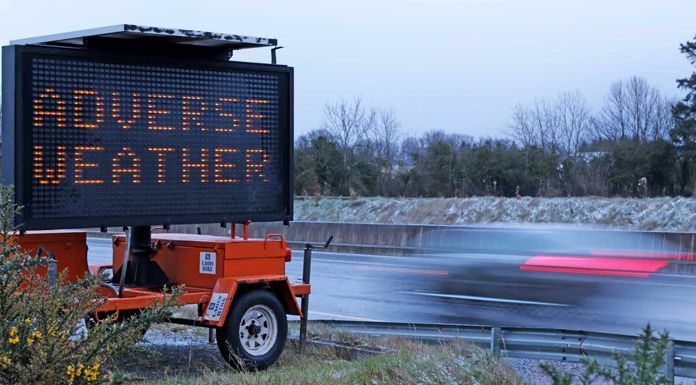 Clare County Council, together with the county’s emergency services, are continuing to monitor the storm as it develops over the coming hours. Clare’s Chief Fire Officer, Adrian Kelly says the adverse weather is likely to impact driving conditions tomorrow morning. The Cliffs of Moher visitor centre is closed for the duration of the Orange Weather Alert which remains in place until lunchtime tomorrow. People are being urged not to visit the site tomorrow morning as conditions will be unsafe. Meanwhile, a blood donation clinic in Kilrush Community School has been moved this evening to the earlier time of 5:15 on account of the expected weather conditions. It will run until 8pm.